Finding the conduction gaps in redo PV isolation procedures is challenging, and several maneuvers have been described. In the present study, we analyze the pace and map (P&M) maneuver [atrial mapping during pulmonary vein (PV) pacing] to locate the gaps in redo PV isolation procedures. Consecutive patients undergoing a second PV isolation procedure at a single institution over a 4-year period were included. For the last 2 years, all the patients (n = 38) studied underwent PV isolation based on the P&M maneuver and were compared to the previous patients (n = 45). The atrial side of the ablation line was mapped with the ablation catheter during PV pacing, and the earliest site was considered a gap site. Shorter radiofrequency time was required to obtain PV isolation in the P&M group (485 ± 374 vs. 864 ± 544 s; p < 0.001), which remained significant after adjusting for the number of reconnected PVs (p = 0.01). We did not find significant differences in the procedure duration (106 ± 46 vs. 112 ± 53 min; p = 0.57) and arrhythmia recurrence during 1-year follow-up (26.6 vs. 28.9%; p = 0.82) after adjusting for several confounding factors (HR 1.32; 95% CI 0.5–3.4; p = 0.57). P&M is a simple maneuver to identify the gaps in ablation lines around the PV. It remains efficacious in redo procedures despite the difficulties in localizing the ablation lines performed in the first procedure. The P&M maneuver reduced the radiofrequency time required to isolate the PV without compromising the efficacy. We acknowledge the cooperation of Rosa Crespo, Cristina Junco, Eva Lizana, Claudia Martín, and Miguel Hernández who helped in performing the procedures. J. Almendral has received honoraria for lectures from Abbott and Boston Scientific. This study was approved by the Hospital Ethics Committee. Leo M, Pedersen MF, Rajappan K, Ginks M, Bashir Y, Betts TR. 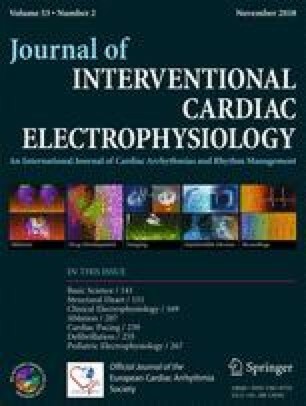 Premature termination of radiofrequency delivery during pulmonary vein isolation due to oesophageal temperature alerts: impact on acute and chronic pulmonary vein reconnection. Europace. 2016; https://doi.org/10.1093/europace/euw102. Kim TH, Park J, Uhm JS, Joung B, Lee MH, Pak HN. Pulmonary vein reconnection predicts good clinical outcome after second catheter ablation for atrial fibrillation. Europace. 2016; https://doi.org/10.1093/europace/euw128.